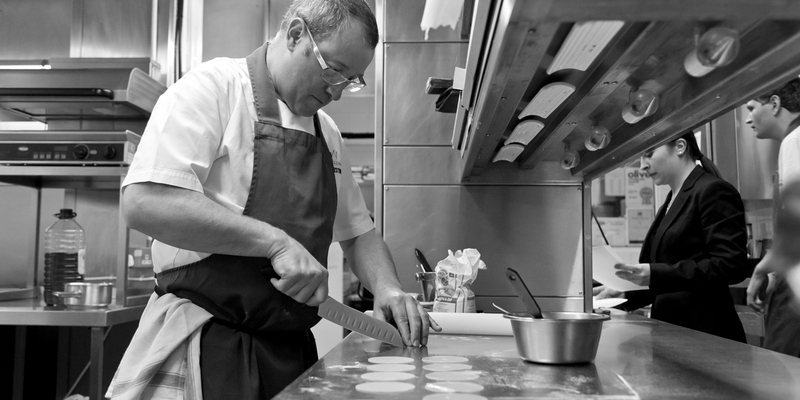 Alyn Williams has worked at some of the very best kitchens in Britain, training for many years under Marcus Wareing and Gordon Ramsay. Now with his own highly successful restaurant, his plates display his own unique culinary personality – brilliantly accomplished, playful and with remarkable interplay of flavours. Born in East Ham, London (and a life-long Hammers supporter as a result), Alyn Williams came from a family that celebrated food. His father had a great passion for gardening, and in his two allotments grew all manner of vegetables – peppers, celeriac, purple kohlrabi, every type of bean – things you didn’t typically see growing up in 1970s East London. Although his father came from a family of simple tastes, he bought cookbooks and taught himself. Producing wonderfully vegetable-heavy dishes from a variety of cuisines, Alyn ground his own spices for Indian dishes and made Italian minestrones. His mother made countless compôtes and jams, with berries from the allotments and any extra they had picked at fruit farms – even filling the draws of the house with fruit that awaited processing. Alyn's first real kitchen job was working as a kitchen hand in a gentleman’s club in St. James, where he gained more and more responsibility in the small kitchen and quickly graduated to cooking. Catering college followed, including a placement at Claridge’s, where he experienced their 100-strong brigade working section upon section, the hotel operating at its extravagant peak. His career progressed through various kitchens, working at Les Alouettes in Surrey, under Michel Perraud, as it won a Michelin star – at that time one of only twenty-five restaurants in Britain with any Michelin recognition. He describes this experience as inspirational, teaching him classical technique, attention to detail and the correct approach to kitchen discipline. Even long into his fantastically successful career, he still considers Perraud one of his greatest mentors. This job was followed by a brief foray into the kitchen of David Everitt-Matthias, at his Michelin-starred restaurant Le Champignon Sauvage. The incredibly high standards of this tiny kitchen proved too much at the time, but he was left with a profound respect for the chef and his enormous capabilities. A long period overseas followed, with Alyn Williams setting aside his culinary career for a life of travel. He describes the time he spent backpacking in India, learning about the country, the people and their food, as a truly life-changing experience. The lessons he learnt in humility and open-mindedness there still impact on him today. He then spent six years pursuing his other love – the ski slopes – teaching skiing and snowboarding in both France and Colorado, United States. Returning to the UK in 1996, he took up a position as chef de partie at Teatro under Stuart Gilles, leaving eighteen months later as sous chef. 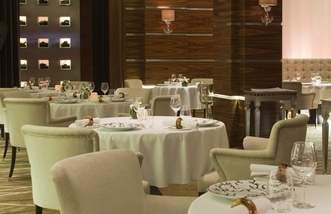 A number of stages at The Greenhouse, Zafferano, Chez Bruce and Pétrus came next, with a job under Marcus Wareing at Pétrus offered as a result. Describing this kitchen as tough, intense and highly pressurised, he nonetheless stayed while many other chefs fell by the wayside, working there for nearly three years as the restaurant won its first star. After a spell running the kitchen at the Groucho Club, Alyn returned to work with Marcus Wareing at Pétrus (now moved to the Berkeley Hotel), working as head chef when it won its second Michelin star in 2007. He describes this as the most fundamental part of his career, where he realised the level of attention needed for both the business and culinary sides of such an operation. He also took on his lessons in dedication, commitment and consistency, saying he now bases his own style of management on this education, although adjusted to his own temperament and goals. He says his food has evolved considerably over the past few years, moving away from the dishes he created with Marcus in mind, to those of his own palate and personality. French classical technique is still at the heart of his cuisine, but his myriad influences and inspirations are also evident, such as his use of Asian flavours in his Tandoori scallops with chickpeas and yoghurt and Pork ‘noodles’, piggy tea, mustards, kombu and shony. His food is characterised by beautiful concentrations of flavour – from big and bold to just a suggestion – with his treatment of diverse textures showing real flair. The food is very much his own, with his nuanced, individual stamp on every dish. He says he is cooking much more gently now than before, innovating, but without creating for creation’s sake. In May 2018, Alyn was announced as the new chef-patron of The Wild Rabbit, where he works alongside head chef Nathan Eades, using the incredible produce of the Daylesford Estate to create food in his inimitable style. Alyn was in the kitchen at Pétrus when the seminal Gordon Ramsay series Boiling Point was filmed in 1999. Alyn says that winning his first Michelin star is his proudest moment, closely followed by his National Chef of the Year victory. Aside from cooking, Alyn's other passions include travel, skiing, snowboarding and supporting his beloved West Ham football club. 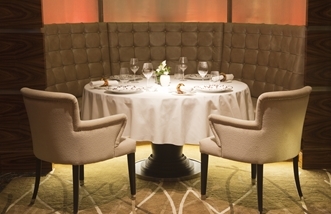 Alyn Williams at The Westbury is the young upstart of the thriving Mayfair restaurant scene, winning a Michelin star after less than a year of service and drawing praise for its daring cuisine.